Beitou Public Library: Taiwan's first green-built library. The roof is made of a lightweight eco material and set with power-generating solar panels. In 2012, the US website Flavorwire.come ranked Beitou Library among "the world's 25 most beautiful public libraries". Thermal Valley: The sulfuric steam that blankets the valley year-round gives the valley a frightening quality, giving rise to nicknames like "Ghost Lake". The springs here have the highest temperatures of any in the Datunshan volcano group. Flower Clock: The clock is characteristic of Yangming Park. Water runs around the flower clock and music is played every hour. Yangmingshuwu: It was originally used by former President Chiang Kai-shek for receiving foreign guests and as a summer home. It was the only residence to be personally picked out and constructed by the order of President Chiang in Taiwan. Today, it is an important cultural and historical site in Yangmingshan National Park which features both natural and human history, making it an intellectually and emotionally resonant recreational site. 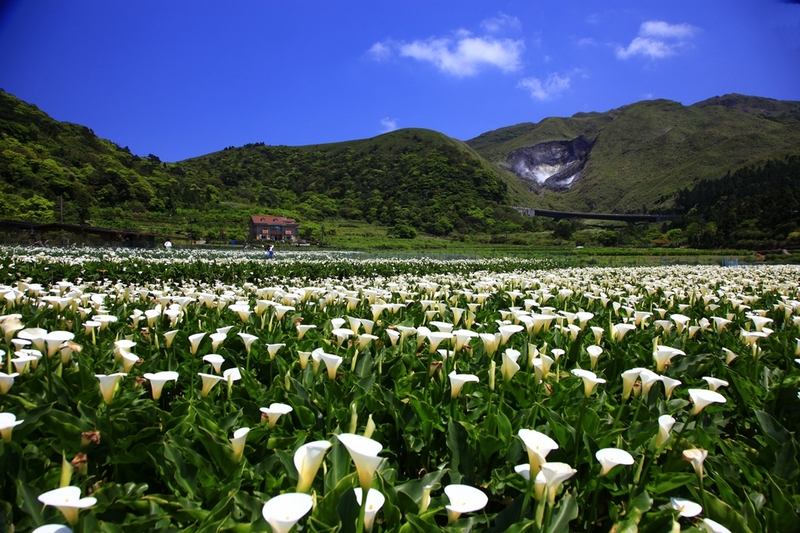 Zhuzihu: It is well known for its field of white calla lily flowers, which are at full bloom from March to May. At that time, the field of pure white calla flowers will draw your eyes away from the distant mountain views while you walk in the Zhuzihu Scenic Spot. Siaoyoukeng Recreation Area: It is a post-volcanic geological landscape area and is located on Mt. Qixing's northwestern foot. The scenic trail can be reached by turning right on the Xiaoguanyin stop on Yangjin Highway. It is famed for the fumaroles, sulfur crystals, hot springs and spectacular "landslide terrain" formed by post-volcanic activity. Cingtiangang: It is a lave terrace formed when the lava from Mt. Zhugao flowerd north after its eruption. Because of its flat terrain, a ranch was established and the read was used as a pasture for grazing cattle during the Japanese occupation. Lengshueikeng Recreation Area: It is a low-lying depression which was created when the lava from Mt. Qixing and Mt. Qigu formed a barrage. Water then accummulated, turning the area into a lake, which eventually leaked out and dried up to expose the lake bottom and form today's landscape. The water temperature of the hot springs in this area only reaches 40 Degree Celsius, far below that of other springs in other areas, hence its name Lengshuikeng, which means "cold water pit". Child Rate is applicable when child is under 12 years old. Prices listed are correct as at 15 JAN 2019, but may change without notice due to exchange rate fluctuations.